As a Greek mythology fanatic, I choose names from Greek for people, places, and things on occasion to bring an ancient feel. I chose Aegis as a codename for Dan Fairmont because he's the protector of the task force, the 'shield' as it were; Zodiak takes name from the Zodiac signs, since they are the source of his power. Sarah uses the name Aether because aether is the fifth element, the one that enables the others to exist—spirit. As Sarah channels certain primordial and godly powers to manipulate the elements, she provides the anchor, the unifying spirit. 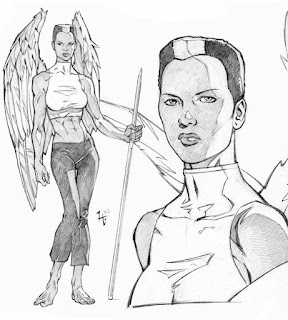 Aleta Halston took the name Aetos because she embodies the Aetos Dios, the eagle of Zeus (wings, talons, genetically altered bone structure that allows her to fly). After Task Force: Gaea—Finding Balance came out, I received questions about her name (as well as why three members of the team had names beginning with "A"). Now, while I'm working on Task Force: Gaea—Memory's Curse, I have the ability (for reasons that become apparent in the novel) to alter some aspects of the story. I had every intention to go with the popular choice of Cloudsplitter, seeing as that is the name of Aleta's weapon, Nephoskizetes. However, a few people commented that a one or two syllable name might be better because it would roll off the tongue more easily. I agreed. So, Cloudsplitter, Javelin, and Thunderstrike came off the list. I was left with Eagle and Talon. So, I thought I would go back to the Greek language and see what the word for 'talon' was. It turned out that in Greek 'talon' is 'onyx'. I liked that name a lot. I thought I had finally found a replacement name, but then a friend told me that a black heroine named Onyx seemed not only cliché, but also a bit racist since (a) an onyx is black, and (b) no other teammate name reflected the color of his or her skin, even by coincidence. After much reflection, I choose Talon. It reflects the eagle aspect of Aleta as well as the weapon that she is. So, in Memory's Curse, Aetos becomes Talon. My nephew is also a Greek mythology fanatic....will show it to him! Interview: No Rules Just Mics—3/26/13 8 p.m.